Zebra offers forward-thinking manufacturers unparalleled visibility into goods, assets, people and transactions that help maximize output, ensure quality assurance and traceability and increase operational flexibility with a smarter, more connected plant floor. 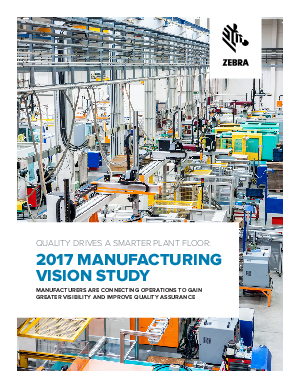 Zebra Technologies commissioned a global study to analyze trends and challenges that impact manufacturing companies. The survey asked 1,100 executives from automotive, high tech, food, beverage, tobacco and pharmaceutical companies for their insights on adopting technology on the plant floor to increase their competitive position.